Aalto University served as the president of CLUSTER 1.7.2016-30.6.2018. President Tuula Teeri was appointed as CLUSTER president for 1.6.2016 – 31.8. 2017 and President Ilkka Niemelä for 1.9.2017 – 30.6.2018. Professor Katrina Nordström of Aalto University acted as Secretary General and Ph.D. Greger Lindén as Coordinator. The strategy of CLUSTER for 2018 – 2022 was updated by an iterative process. The work started at the Steering Committee meeting at KU Leuven, Belgium in 2016. The working groups assigned to the process were approved by the General Assembly held at INP Grenoble, France in 2017. Three specific themes were identified 1) Mission, Vision and Values of CLUSTER 2) Communications 3) Ways of Working. As a result of the strategy work, the CLUSTER Statutes and Internal Procedural Regulations were amended on 13.4.2018. Vision, Mission and Values were at the focus of the Steering Committee meeting at EPFL, Lausanne, Switzerland, in May 2017 and at Aalto University, Finland in November 2017. The final approval was made by the General Assembly held at TU Darmstadt, Germany in April 2018. Cluster Universities share a common world view with European members, and associate members and partners around the world, connecting and respecting different societal and multicultural communities and equality. Cluster promotes creativity, originality and inspiration in education of future engineers, for finding innovative solutions to global challenges. cluster is committed to ethical, safe and sustainable use of technology, campaigning also for open science. Cluster is a leading consortium of Universities devoted to excellent research-based engineering education, entrepreneurship and industrial co-creation. Cluster is a driver for the proactive development of skills and mindset in engineering education of future professionals, promoting transdisciplinary ecosystems as hubs for excellence in research and education. The multidisciplinary Cluster community contributes university-based research toward innovations for the well-being of society and the environment, in collaboration with industry and start-ups. Cluster is a proactive advocate of engineering futures for policy decisions, implementation of research programs and frameworks at the regional, national and European level. Communications as part of CLUSTER strategy work focuses on increasing the visibility of CLUSTER for both external and internal stakeholders, including renewal of the webpages as well as developing a communications plan. The new webpages were finalized at the end of the Aalto presidency and the work of the communications plan continues lead by KIT, Germany. Specifically, the aim is to increase the attractiveness of CLUSTER universities for student exchange, dual degrees, joint degrees and other similar actions. Ways of working focuses on Departments, Task Forces and Working Groups. During the strategy work, the number, topics and actions of CLUSTER Departments, Task Forces and Work groups were reviewed and the activities were streamlined as follows. The Industrial Engineering Department is coordinated by INP Grenoble, France and the Civil Engineering Department by TU Darmstadt, Germany. Both Departments are actively involved with development of CLUSTER “packages” for student exchange, which focus on pre-designed completion of 30 ECTS during student exchange. These Departments also offer events for faculty and staff. CLUSTER has two Task Forces, SEEEP (Sino European Engineering Education Platform) chaired by IST Lisbon, Portugal, and GAST (Grants and applications), chaired by KTH, Sweden. Working groups are formed around different projects and topical initiatives. These Departments, task Forces and Work Groups act in accordance to the Mission of CLUSTER. Educating professionals to drive the development of paradigm shifting solutions to future societal challenges for the well-being of society and the global community. Seeding innovation in sustainable use of natural resources and energy Conversion and efficiency, combating climate change, providing solutions to health and well-being to create new jobs and prosperity. Conducting visionary, forward looking research targeting the promotion of societal improvement and advancement through responsible use of science and technology. E4T Entrepreneurship Education in Engineering and Technology 2017-2020. EUCRITE Centre for the Integration of Refugees into Engineering Education Erasmus plus 2017-2019. MSCA-Cofund proposal on doctoral education. IST Lisbon leads the planning process of the proposal which targets CLUSTER and SEEEP doctoral education. The intended submission deadline is September 2018. The 7th SEEEEP Workshop was held in Guangzhou, China, 7-9 November 2016 hosted by South China University of Technology. Representatives from CLUSTER universities participated in the meeting together with Chinese partners. The Guangzhou Promotion Plan was published outlining future collaboration of the Chinese and European partners. The high-level doctoral programs and schools were reviewed, funding actions were discussed and experiences on quality assurance, best practices of curriculum design and accreditation were discussed. The meeting was attended by high-level representation of the Ministry of Education, China. The 8th SEEEP Workshop was held at Aalto University, Finland 28-29 November 2017. The meeting was attended also by The Ambassador to Finland of the Peoples’ Republic of China. The focus was on Chinese-European collaboration in education with emphasis on entrepreneurship and innovation. The CLUSTER –SEEEP presidents’ meeting on November 29th was jointly chaired by CLUSTER president the chair for SEEEP, Tongji University. Some 40 representatives of the Chinese partner universities of SEEEP attended the meeting as well as CLUSTER Presidents their representatives from 12 partner universities. The 9th SEEEP workshop will be held on 25-26 September in Quingdao, hosted by the China University of Petroleum. The 9th SEEEP workshop agenda was announced in April of 2018 and invitations to the meeting were forwarded by the CLUSTER secretariat to all members. High-level doctoral schools have been held in 2016 in Stockholm and Eindhoven (Energy transitions: EU CO2 Neutral), in Shanghai and Hangzhou 2017 (Energy Systems in Cities), and planned for August 2018 (Energy Systems in Cities) at Stockholm and Eindhoven. CLUSTER collaborates actively with other technical universities’ and university associations. Joint statements have been issued on the EIC (2016) and the FP9 (2018). In 2017 CLUSTER issued also its own statement on the H2020 as part of the Midterm review. The work on influencing the FP9 budget is continuing together with other associations as of 2018. The CLUSTER symposium on Entrepreneurship in Engineering Education was hosted by Aalto University 27-29 November. A total of 136 individuals participated from 16 countries, of which 40 participants from China. 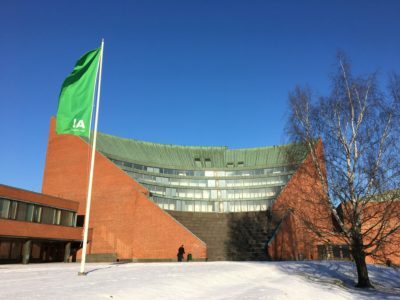 The meetings started on November 27th with a hands-on session at the Aalto University Design Factory, where participants could become acquainted with the Aalto mindset for teaching and learning and the entrepreneurial ecosystem of Aalto. On November 28th the CLUSTER steering committee was held, followed by the 8th SEEEP workshop. The CLUSTER -SEEEP dinner was hosted by the Espoo City Museum WEEGEE. Wednesday the 29th was the main day of the symposium, which featured hands-on learning by doing sessions on development of education and learning pedagogies in line with the theme of entrepreneurship. CLUSTER partner universities (KU Leuven, UCL, TU Darmstadt, TOMSK, TU Eindhoven, KIT) presented showcases on innovative approaches of integrating entrepreneurship into engineering education. Keynotes were given by Professor Hellman, Oxford University, UK, Humera Fashihuddin from the Stanford University d-school USA and Ken Singer from Berkeley University, USA. These outstanding presenters were joined in a panel by Mr. Kalle Airo from the Aalto Ventures Program (AVP). In accordance with the Aalto principles on sustainability, this symposium was paper-free and materials are only available in digital format as videos on www.cluster.org. SLUSH http://www.slush.org/ which is the largest start-up event in Europe with some 20 000 participants (start-ups, investors, other stakeholders), was an optional event on 30th of November as a finalizing touch to the theme of entrepreneurship in education as SLUSH has originally been established by Aalto students. Aalto University wishes to thank all CLUSTER members and associate members for their active contribution to CLUSTER activities and actions during 2016-2018. Thank you all for excellent collaboration !